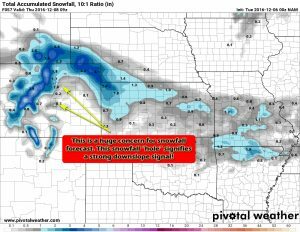 Arctic Storm to Bring Cold and Snow to Castle Rock This Week! With the storm approaching Colorado a number of weather watches and advisories have been issued. There are two separate Winter Weather Advisories issued for the front range, the first issued for the foothills is for 4-8 inches of snow and treacherous travel conditions. The second includes the Denver Metro Area and Douglas County below or around 6,000 feet (this includes the town of Castle Rock. 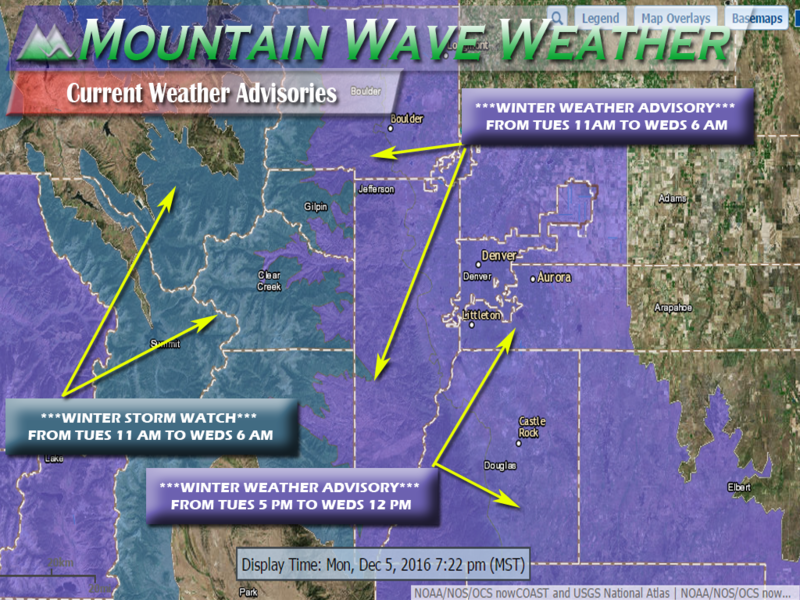 Additionally, the mountain areas West of Denver have a Winter Storm Watch issued for larger amounts of snowfall. Should this upgrade to a warning (and I suspect it will) expect very difficult travel conditions during the warning period. Models have been consistently bumping snow totals down throughout the day. There are a few factors contributing to this, Many models don’t have the low pressure center pushing far enough South to set up over Southeastern Colorado. Additionally the positioning of the low pressure center in most models does not allow for significant enough upslope to develop. In fact, it shows a stronger signal for downsloping along some areas of the front range. While I’m tempted to hang on to my own 3-6 inch forecast for Castle Rock I can’t deny the stronger downslope signal and less than stellar position of the low on the models. For now I will adjust snowfall totals slightly lower, you can see from the probabilistic forecast above that the most likely range for Castle Rock is up to 3-4 inches. Once we get over 4 inches, the chance of hitting that number drops significantly. Still, I think the colder air will prevail a bit if the snowfall holds, my new range is 2-4 inches. I suspect some areas in Castle Rock (especially western areas of Douglas County) could very well see more in the 3-6 or even 4-8 range. 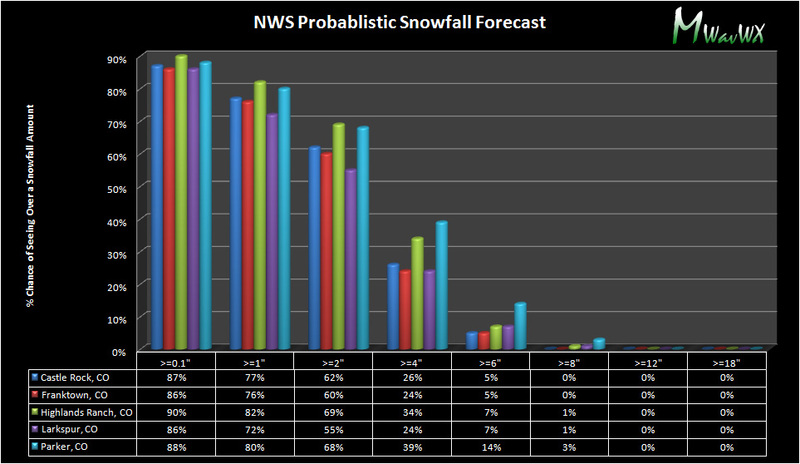 Here’s the latest snowfall products for the NWS, they match up to the probabilistics pretty good. The only things that still give me pause about this system is the uncertainty that still remains between models. Some still show a solid 4, to 6, to even 8 inches of snow but others show nothing at all accumulating in the Castle Rock area. This is something that needs to be closely watched through the day on Tuesday. I’ll be watching the data and pass along any changes. Strong downslope signal is a huge concern for snowfall along the front range and Palmer Divide in latest model runs. I’m still sticking to a range withing but slightly less than the NWS range for Castle Rock. I can’t stress enough that with as much model uncertainty as this storm has right now, I expect this forecast to change all the way up until Tuesday night. We have a definite possibility of seeing less snow than originally though, there is also a smaller but still existent chance we see more than 2-4 inches. The snow with this storm is still scheduled to move into the area later in the day on Tuesday. I expect this to be in the late evening and overnight hours of Tuesday. We will need to keep a close eye on Tuesday evening’s commute as it could get a bit slick if the storm arrives a bit early. Expect snow to continue through the evening Tuesday and into Wednesday. All indications at this time are that the main bit of snowfall should be over by Wednesday around the lunch hour. 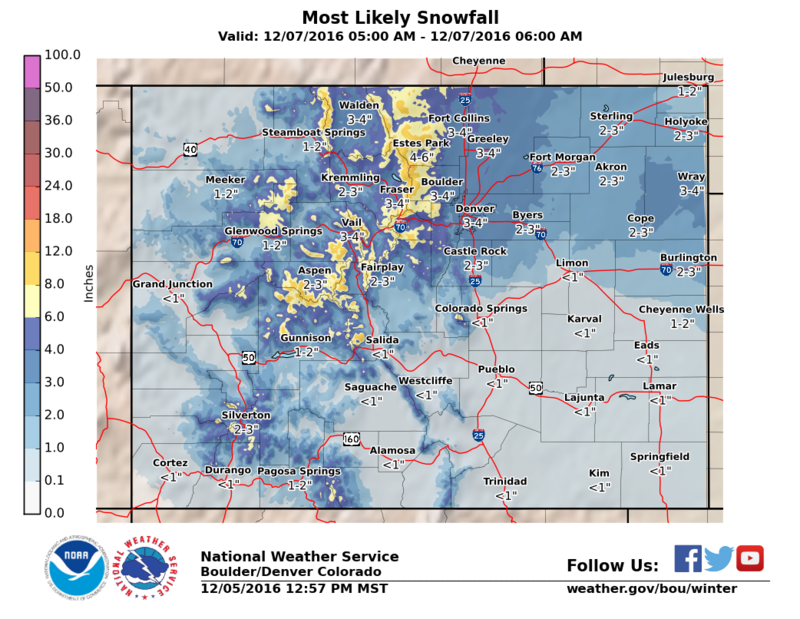 Still a ton of uncertainty with the models on snowfall but one thing they do agree on is a drop in totals along the Palmer Divide and even maybe for the Denver Metro Area. 2-4 inches is the range most likely in Castle Rock at this time. I expect this to change a bit before the storm’s arrival so we’ll keep an eye on this for changes. The snow impact is still expect late in the day Tuesday but some models show the snow moving in a bit later. The Tuesday commute could be slick if the storm moves in early or if snow starts sticking sooner. Wednesday morning’s commute will also ultimately depend on how much snow accumulates through the night and how well road crews can keep up. Keep a close eye out for tough travel conditions on Tuesday evening, overnight Tuesday and into Wednesday morning. This storm is continuing to be tricky for our models, I’m concerned downslope conditions could kill a lot of potential for our snowfall. A lot of models are showing this already so it gives me pause. I’m not ready to completely discount snow just yet, so I’ve just dropped expected snowfall totals slightly for Castle Rock. I’ll be watching Tuesday’s data closely to see if the downslope signal continues to erode the mositure in this storm or if we stay in the 2-4 inch range. In the meantime, this again will not be a major storm, at worst it may be slick on the roadways Tuesday night and Wednesday early. But this does not look like a “blizzard” type storm. We usually don’t get those out of the Northwest, so that’s something to keep in mind. I’ll have another update Tuesday with the latest updates and data.